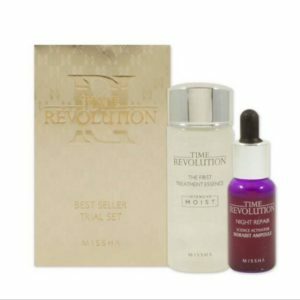 Use this bestselling duo on a daily basis to discover and experience more beautiful, glowing skin!! 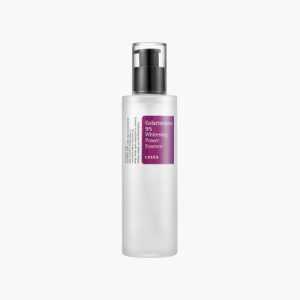 First Treatment Essence 30ml: liquid type essential Essence hydrates, purifies, and soothes skin.The very FIRST step to your skin care regimen.Back to the Basics, a Stepping Stone to a Healthier and New Skin.Contains 80% Fermented Yeast Concentrate, which absorbs into skin instantly to energize your skin. Also contains Niacinamide, a Vitamin B3 component, to improve skin elasticity, enhance skin barrier function, and revive skin tone and texture. DN-Aid, made from Cassia-Alata Extract, provides vitality to aging skin, protects DNA from aging caused by UV rays, and promotes restoration of damaged DNA.THE FIRST TREATMENT ESSENCE improves fine lines and skin tone. The miracle water hydrates, restores, rejuvenates, and gives you a glowing complexion. Activator Ampoule 10ml: concentrated essential Ampoule moisturizes, firms, revitalizes, and nourishes skin. Use the essential Activator Ampoule daily in your nighttime routine to get smooth and firm, beautiful skin. 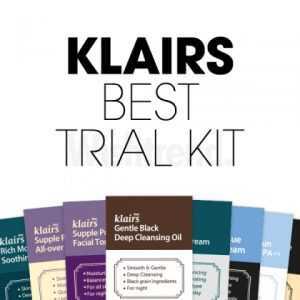 It provides your skin with extra nutrients and moisture lacking from your basic skincare. Known for its excellent hydration and calming effects, the ingenious Hippophae rhamnoides fruit extract works together with the distinguished Bosung Camellia sinensis(Green Tea) leaf extract (11% vitamin C & 10.5% vitamin E) for the ultimate vitamin sheet mask your skin needs ! 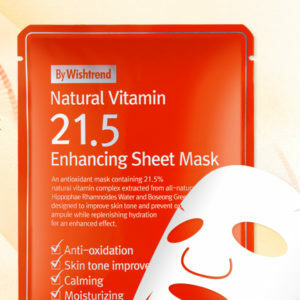 The BY WISHTREND Natural Vitamin 21.5 Enhancing Sheet Mask is made with not only 21.5% vitamin,but 23g of bountiful essence per sheet mask ! The best part? 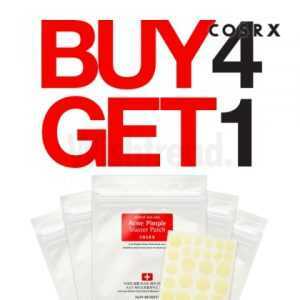 You can use the BY WISHTREND Natural Vitamin 21.5 Enhancing Sheet Mask with the BY WISHTREND Pure Vitamin C21.5 Advanced Serum or any serum for the ultimate vitamin C experience to amplify and maximize the results of whitening, moisturizing, calming, and anti-aging !